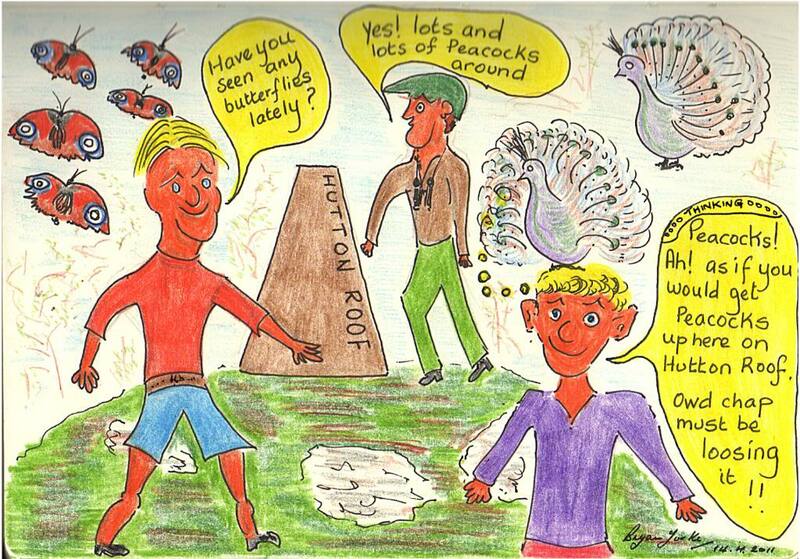 "Peacocks on Hutton Roof" - They'll be about today that is for sure, and just look at last we've got sunshine! it didnt take us long to get a tan! Chiffchaffs "Mo" and "Lee" are both calling this morning. Lots of hirundines and Swifts are displaying and feeding. But still only the eight birds at Russell Farm. Lots of Tree Pipits singing throughout, also Blackcaps and Willow Warblers, but no Cuckoo calling in Dalton, however I did hear one calling in the very far distance somewhere between the Docker to Newclose Coppice areas. Lily Of The Valley at its best now. Had first Cinnabar Moth today busy laying its eggs on the small ragwort plants. Really enjoyed giving my talk at the beautiful Heron Theatre at Beetham for the AONB Landscape Trust who's members were such a good appreciative crowd who really enjoyed the talk. A friend from Blackburn calls for me and we do the annual trip up to Appleby Horse Fair, so nothing to report on the local front. Sky absolutely full of hirundines near to Green Dragon Farm with both Swallows and Martins. "Mo" the Chiffchaff calling from the bottom of Mowbray Drive. "Miss A Note" Chiffchaff, Blackcaps and Willow Warblers together with plenty of the more common species, also Tortoiseshell, Peacocks, Speckled Woods, Large Whites, Green Veined Whites Butterflies etc. Had Mo the Chiffchaff calling. Hirundines doing aerial displays at Green Dragon Farm, still shortage of Swallows at Russell Farm. Both Cuckoos calling and seen in Dalton (upper) one at the bottom and another at the top. Tree Pipits in full song in Dalton Crags both sides whilst going up, and then again at two points in Dalton (upper). Also Tree Pipits seen at the top of Lancelot Clark Storth and also at the top of Burton Fell. Several Green Hairstreaks seen at a couple of bilberry locations. Came specifically today to try and see the Fly Orchids, but I do think that I am too early, but lots and lots of Early Purple Orchids everywhere. Yesterday (Sunday June 2nd 2013). In the morning did a check around the Plain Quarry and Dalton East side, heard two Chiffchaffs singing which I presumed to be Craig and Craggy. Two Blackcaps noted at the usual breeding sites. Also had first (for me) of the year "Small Heath Butterfly". Later in the day (Sunday June 2nd 2013). Had a check over on Slape Lane and the nearby woodlands for any noticeable Spotted Flycatchers but none recorded as yet. Still that relentless cool wind.